Forget about dark circles and imperfections. Charlotte Tilbury's Magic Away Liquid Concealer offers full coverage for great-looking skin, every day. This make-up essential comes in a gorgeous 4ml twist flow pen custom-developed jointly by the brand and Quadpack, to offer precision application and a look that’s pure luxury. Charlotte Tilbury has a very distinctive brand image and a product range that combines performance with comfort. 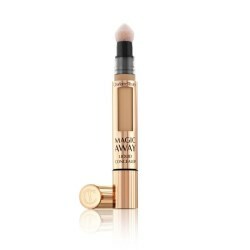 For its new concealer, it needed a flow pen with a very precise applicator. Quadpack’s global make-up team developed a bespoke flocked sponge in the shape of a tipped sphere. Soft and smooth to the touch, its flat surface allows wide coverage, while its pointy tip targets specific areas. Every visible part of the pen is tailor-made – from the twisting base, through the body and sponge, to the cap. With 16 shades in the range, the aluminium-sheathed body features a viewing window, offering a smart solution for colour selection. Both the cap and twist base are personalised with vertical grooves to match Charlotte Tilbury’s aesthetic. The logo also appears debossed on the top of the cap. All aluminium parts were anodised the brand’s signature rose gold, with night crimson lettering screen-printed on top. Launched worldwide late summer 2018, supported by a huge social media campaign, consumer reaction has been overwhelmingly positive. Makeup artist and entrepreneur Charlotte Tilbury was honoured with an MBE (Member of the Order of the British Empire) by Queen Elizabeth II, for services to the beauty and cosmetics industry, at the Queen’s Birthday Honours List 2018 on 9 June. Korean brand The SAEM is all about nature. There, it finds inspiration for its products, which focus on natural ingredients and healthy beauty, with an emphasis on ethnic wisdom and a deep respect for the environment. When it developed its new prestige skincare range for men, it wanted the packaging to reflect its ethos, so wood was a natural choice. Prismologie is leading the way in today's trend in wax sticks, repurposing a bodycare pack for a truly sumptuous body balm. Loewe is known for enduring luxury, blending classic substance with modern aesthetics. Its Loewe Esencia Eau de Parfum fragrance was launched in 1988, yet is continually refreshed, making it relevant and desirable for today’s generation of men. So, too, the latest flanker, which comes in a dramatic black bottle with a stunning wooden cap, created by the master craftsmen at the Quadpack Wood factory in Spain. Tucked away in the St Denis district, La Distillerie de Paris is a boutique distillery run by two brothers. Since 2015, Sébastien and Nicolas Julhès have been creating artisanal gins, vodkas, brandies, aged spirits and whiskeys. Now, they have applied their expertise to launch their very first eau de parfum, exclusively packaged in a bespoke bottle and box by Quadpack. Charlotte Tilbury Hollywood Flawless Filter is a customisable complexion booster that has the versatility of a face primer, the mega-watt glow of a highlighter and the perfecting properties of your favourite digital filter. It contains special ingredients that help to soft-focus, illuminate skin and make lines and pores appear smoother. Rossetto Unico is Collistar's new premium lipstick. Available in 16 vibrant shades, its rich, creamy and ultra-comfortable texture glides onto your lips, for long-lasting colour that doesn't smudge. A companion product to Collistar's best-selling Mascara Unico, Rosetto Unico deserved a premium treatment in terms of packaging. Trinny London's capsule range of cream-based make-up offers stackable, portable perfection, in signature packaging developed by Quadpack. 'The Stack' enables you to build your own personal make-up kit with a choice of face, eye, cheek and lip colour. The products come in transparent 5ml pots which click together in an attractive stack that also makes them ideal for travel. Lalique Odyssée is an exceptional diffuser which embodies the essence of the brand’s refined expertise. With a choice of three perfumery creations held in a crystal bottle, this is home fragrance raised to new heights of luxury. Its gleaming zamak cap and beautiful gift box were proudly developed by Quadpack. Giorgio Armani's Acqua di Giò Absolu fragrance for men celebrates the union between fresh water and warm wood. Maintaining the iconic shape of the Acqua di Giò bottle, it is topped by a unique cap made of sustainably-sourced ash wood, made at the Quadpack Wood factory. The Healthy Underarm Detox Mask by US brand Lavanila is an all-natural treatment mask formulated to detoxify and beautify the underarm area, while working to ease the transition to a natural deodorant. This entirely new body care concept comes in surprising packaging developed by Quadpack. The brand needed a solution to protect the complex formula, while simultaneously making it easy to dispense and apply. Quadpack's Brush Tube provided the answer. British boutique brand Delilah offers carefully-formulated cosmetics which offer women a touch of understated luxury they can enjoy every day. Pure Light Liquid Radiance is one of its latest treasures: a beautiful liquid illuminator, which instantly brightens and evens out skin tone, giving a lit-from-within glow. Perfume is precious and we wear it like jewellery. As such, it should be kept in a precious case. So says La Cristallerie des Parfums. The niche French brand was created in 2015 by Helena Robin and it has found a loyal following in the ultra-luxury market. Now, she is targeting men with a new range, suitably encased in sumptuous packaging. Quadpack helped her fulfil her vision. Premium beauty brand Skeyndor is celebrating 50 years of innovative skincare. To mark this anniversary, it has launched Timeless Prodigy, an anti-ageing range that brings together luxury and science, to slow down cellular ageing for a youthful genetic expression. The serum and cream look spectacular in their anniversary-edition packaging, manufactured and developed by Quadpack. Charlotte Tilbury's #GLOWMO collection harnesses the power of glow to deliver a radiant look. Part of the range are two self-tanning products that promise a bronzed, beach look all year round – for both women and men. The hydrating tinted moisturiser and Overnight Bronze & Glow mask, packaged by Quadpack, come in two-tone tubes with a unisex design. When Ozohu Adoh couldn't find a skin care product that effectively treated her dry, uneven skin, she created her own. Using organic ingredients from her native Africa, she developed a formula that addressed the skincare issues faced by women of colour. Her brand, Epara, is a new luxury skincare brand for women of colour, exclusively available at Harrods. A woman in beautiful lipstick can brighten a room like a bunch of fresh flowers, says New Zealand brand Karen Murrell. That captivating burst of beauty inspires everything it does. Its latest lip product comes in a palette developed by Quadpack, offering a handy array of naturally beautiful shades like a luscious bouquet. Guerlain's feminine fragrance range L'Art et la Matière has been revamped with an elegant wooden cap, made at Quadpack's Technotraf wood factory. Neroli Outrenoir, Cruel Gardenia, Spiritueuse Double Vanille, Tonka Imperiale and Joyeuse Tubereuse are all part of Exclusive Collections, "a range of fragrances for aficionados of rare scents, those who appreciate noble raw materials and refinement down to the last detail". Spanish niche brand Carner Barcelona exists to capture the spirit of the Mediterranean in its exquisite perfumes. Its Black Collection features three new fragrances that celebrate the different cultures that shaped the region's soul. Each are complemented by Carner's 'signature of elegance': a wooden cap, produced by Technotraf at Quadpack's Manufacturing Division. Founded in Milan in 1930, ICIM International is known in Italy and abroad through its leading dermocosmetics brand BioNike. Its mission: to provide innovative solutions that bring beauty and health to skin. Over the years, ICIM's formulation know-how has resulted in a product range distinguished by its 'Without Philosophy': without parabens, without perfume, without gluten and nickel-tested. This philosophy is reflected in its new Defence Xage Eye Lift, a hard-working eye contour serum that's packaged by Quadpack in a tube with a very special applicator. "At first I was a bit flummoxed by the packaging because, it may be a first, but what difference does that make to the actual product? I soon changed my mind when it squished perfectly into my in-flight transparent beauty bag for my long haul flight to New York. The packaging is actually incredibly efficient and it was indeed the best travel option." Tooth whitening is all the rage. A brilliant smile is now becoming an essential part of any look. And TINT is among the first to provide a simple, effective solution – by cleverly integrating it into the daily make-up routine, using a lipgloss pack from Quadpack. Male grooming is a rising trend. Just as women want to look after their skin, so do today's men. Black Leopard addresses this need with a full range, from an anti-shine moisturiser to a 2-in-1 shave gel cleanser. The Encre Noire saga by Lalique takes its inspiration from the 'Encrier Biches' (inkwell) designed by René Lalique in 1913. First introduced in 2006, the latest edition is an intense, masculine fragrance that sheds new light on the personality of the Encre Noire man. The powerful woodsy blend of cypress and vetiver is reflected in the packaging, which features a wooden cap produced by Quadpack Group. Guerlain's Terracotta bronzing powder is back with Pause d'Été. The star of the 2016 Terracotta Summer Collection, it once again comes packaged in a beautiful wooden compact expertly crafted at Quadpack Group's Technotraf manufacturing facility. The 2016 edition is just as sumptuous as its predecessors. Inspired by the sunny terraces of the French Riviera, its exquisite palette captures all the reflections of the sun. "The heart chakra is an all-encompassing 'source-centre' of love, joy and compassion; our connection to life and all living things." So says Kora Organics in explanation of its new Heart Chakra Essence roll-on, its packaging developed by Quadpack Group. Just launched in Australia, the product comprises certified organic oils to nurture and heal the heart chakra. Scent is the one sense that impacts directly on a person's state of mind. Your favourite fragrance can instantly make you feel good and ready to face the world. Carrying it around with you therefore makes sense, which is why Jean Patou issued two of its most popular fragrances – Sublime and Joy – in 10ml sprayers. The bottles come in a velvet pouch developed by Quadpack Group, turning them into something special, while protecting the bottle and making them easy to locate in a handbag. Men's grooming products are now so commonplace, it is hard to remember a time when they were not. Yet Clarins Men continues to shine brightly in the market with its high-quality formulas, diverse range and distinguished petrol blue, white and silver presentation. When launching two new products – Anti-fatigue Eye Serum and Revitalising Gel – the company turned to Quadpack Group company Yonwoo Europe for a bespoke packaging concept. Atelier des Ors is driven by a passion for the heritage of French Haute Parfumerie. Its "magnetic, passionate, elegant and sophisticated fragrances" are the height of luxury, each one containing flecks of gold. The packaging is equally precious, creations dreamed up by Centdegrés – and has been brought to life with some help from Quadpack's Fragrance Division. Award-winning pharmaceutical company Prima-Derm has revamped its XPERT range using Quadpack's Q-Line 50ml Acrylic Jar. Part of its flagship brand SingulaDerm, the Barcelona-based company wanted to modernise the OTC range with a new image and the jar's clinical look and feel fit the bill perfectly. For the makers of Organic HairSpa, a new range of organic hair care products from Denmark, the packaging had to be as carefully considered as the organic formulas inside. Quadpack's Body Care Collection, together with wooden caps from Technotraf, provided the perfect solution. Nothing beats freshness. This is the premise of new Danish beauty brand Nuori, who has built its business around 'fresh'. This means pure products, free from preservatives and synthetic additives, and 100% efficacy, as the active ingredients are not weakened by time-related breakdown. As such, all of its products carry a sell-by date. Beauty brand Erborian adapts Korean skincare expertise to beauty rituals around the world. One of its latest offerings brings traditional Korean cleansing routines into the modern age, in a new collection packaged and supplied by Quadpack.